Two participants discuss the merits of having everyone wear matching Eugene Pedicab hats. 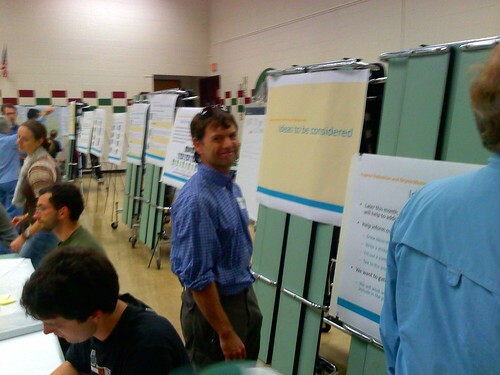 If you missed last Friday’s Ped and Bike Master Plan open house, you really missed out on a lot of fun. Estimates put the attendance around 70 participants, which helped create a party-like atmosphere full of innovative discussions about fancy new ideas and treatments. While all these are great options, they don’t quite give you the experience of attending the event. 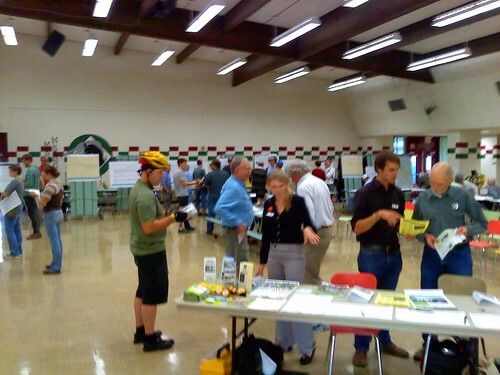 This is sad, because it was fun and informative, and full of ideas aimed at increasing cyclist ease and ridership numbers (despite what some negative bloggers who didn’t attend the event would have you believe). Take the jump to start the adventure (and view a PDF of the materials in case you missed it). Hey folks, George here. 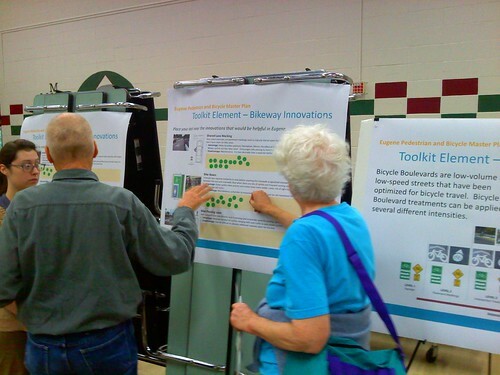 I attended this open house because I am an avid cyclist – I can use that term because it wasn’t cliche yet back in late 1800’s – and because I wanted to give some input into how I think this city could improve its bicycle infrastructure. Sure, we have a 10.8% cyclist mode share, but I’d like Eugene to be the first US city to reach 25%! Remember, the original paved roads from back in my day were created for bicycles, not automobiles. I read in a flier that “the vision of the Eugene Pedestrian and Bicycle Master Plan is to increase the share of trips Eugene residents make by walking and bicycling for transportation and recreation by making walking and bicycling safe, convenient, and comfortable.” It sure seemed like I was in the right place. The first thing that struck me when I arrived was that they had provided indoor bike parking. Nothing makes a person feel more welcome than that! 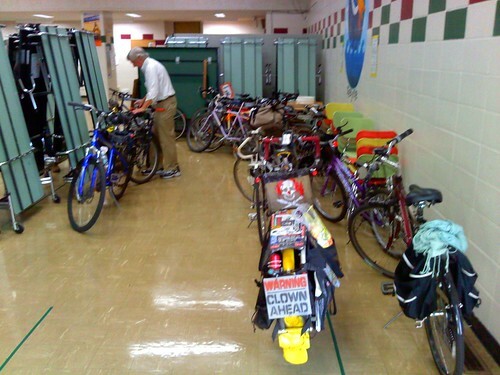 Indoor bike parking, this got packed! This picture was taken early in the event, and eventually this entire area was full of bikes. I didn’t take a picture of the packed parking because at that point in the night I was too busy wondering why they bothered providing coffee it all they were going to have was decaf. It’s not that the event was boring, but I really like coffee. Real coffee. Anyways, after parking my bike I was greeted at the sign-in table by non-other than InMotion writer and Smart Trips coordinator Lindsay Selser. 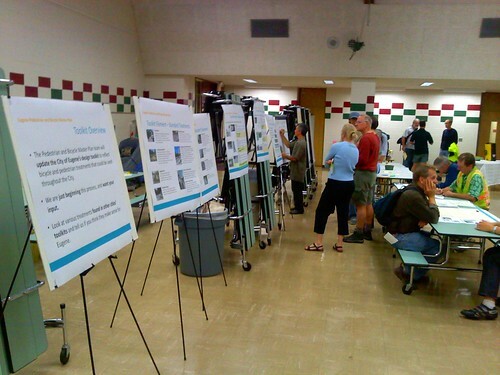 At this table was a ton of great information about the ped/bike plan process, bike maps, and a rather gigantic comment card (pdf) that included a large map so I could tell the city exactly what I wanted done. I noticed that there was a spot on my rather gigantic comment card (pdf) to indicate if I agreed or disagreed with their assessment, and to make corrections. Having participated a little during the City’s original call for input back in August, I felt that their assessment was in line with my observations. This left me a little uneasy, however, but I wanted to give opinions, AND I WANTED TO GIVE THEM NOW! In a rather creepy prediction of my childlike tantrum, the next step in the open house journey provided me a very satisfying and lucrative chance to throw my opinions around unhindered. They provided me with a gigantic post-it note and a big fat marker! Gone were the days when use of such implements was reserved for teaching reading to kindergartners and diagramming football plays – now the power was in my hands! "What do you think about existing conditions?" 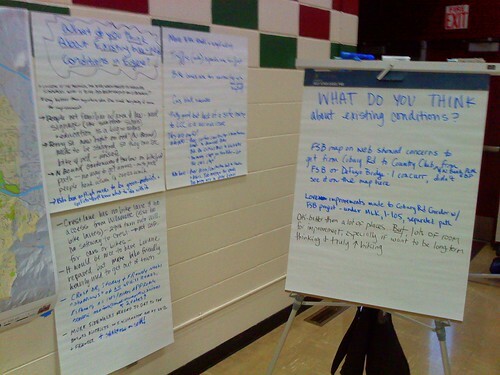 Not only was this method of providing feedback fun because I got to sniff the markers, but this also gave participants the ability to comment on each-other’s ideas. 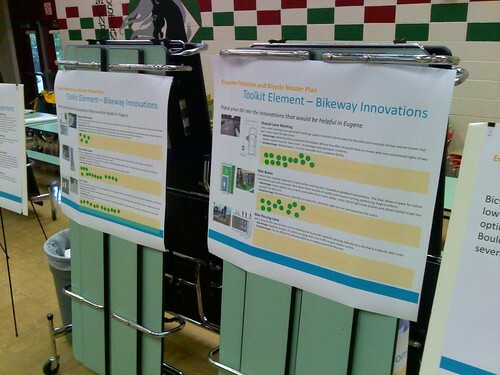 After publicly displaying my 1880 newspaperman writing skills, I moved on to the next section of the open house – several posters explaining the “standard toolkit elements” that the City already uses to promote walking and biking (shared-use paths, bike lanes, pedestrian islands, etc) and new innovative treatments like bike boulevards, cycle tracks, shared lane markings, and bike boxes! It was clear that these new treatments were to work in tandem with the old standards like bike lanes, and that they weren’t there to replace them. I noticed that most of the participants spent a lot of their time in this area learning about the options available to make walking and biking more enjoyable. 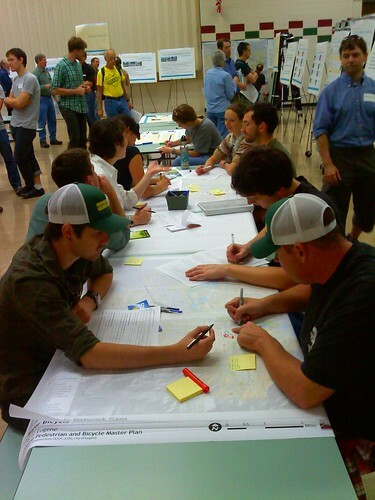 I didn’t know a whole lot about these things before the open house, since WeBikeEugene hasn’t ever posted a comprehensive guide (the jerks) and I don’t read BikePortland religiously unlike some WBE editors. When I was doing most of my riding America hadn’t fallen in love with the automobile yet, so we didn’t have to go to such extremes to promote cycling. You can view these posters for yourself in the PDF at the bottom of this story. Luckily Shane MacRhodes of Safe Routes to School and WBE was there to help explain things! After reading WAY more stuff about bike infrastructure than I ever new existed, I had a chance to become a participant again! This time I got to use stickers! After exercising my democratic rights I decided that standing was stupid. Luckily the open house folks predicted my sudden change of heart and presented me with a slew of maps covering several tables. 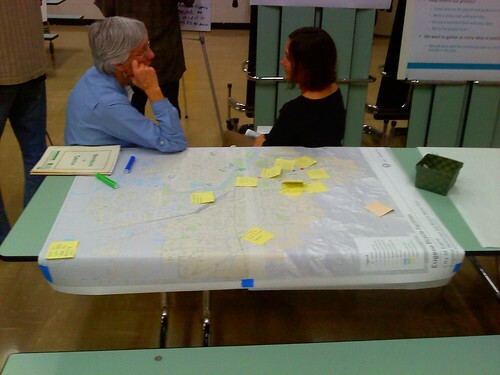 A quick scan showed that these were maps of Eugene with tracing paper over them, and people were encouraged write comments and draw in infrastructure changes wherever they wanted them. I wrote on a map that they should turn Hilyard between East Amazon and Dillard into a bike blvd as a connector to Fox Hollow, just in case the city didn’t get my several telegrams on the subject. Unfortunately the street isn’t wide enough for a bike lane. After scribbling on and covering several maps in post-it notes I was really starting to feel like my ideas might make a difference, and getting a little giddy that maybe the City will listen to and me build a ski-lift over 30th ave. It was at just this moment I noticed yet another way that I could demonstrate my superb printing skills! We were encouraged to write exactly where we’d like to see certain treatments on a poster listing the different infrastructure options. Many people had ideas of where to put shared lane markers (sharrows), but no-one was advocating to replace bike lanes with sharrows. Bike passing lanes also proved to be more popular here. After writing all-over everything that I could, I sat down and finished filling out my rather gigantic comment card (pdf) (seriously, this think was like 2 feet long). I hung out for awhile after I was finished; enjoying the conversation, party atmosphere, eating free cookies, and wishing that the coffee wasn’t decaf. I stayed to watch the Bicycle and Pedestrian Advisory Committee (BPAC) meeting scheduled for right after the open house, but I won’t show a picture because Seager has assured me from his past experiences that y’all stop reading the second he starts writing about meetings. You can view the full slideshow of the open house and meeting on Flickr. After the meeting most of us who were left joined with BPAC members and City officials for large group ride back south to the river path where we all went out separate ways. I felt I was in the Disneyland Electric Parade due to all the flashy bike lights, which put the kerosene lantern that I ride with to shame. 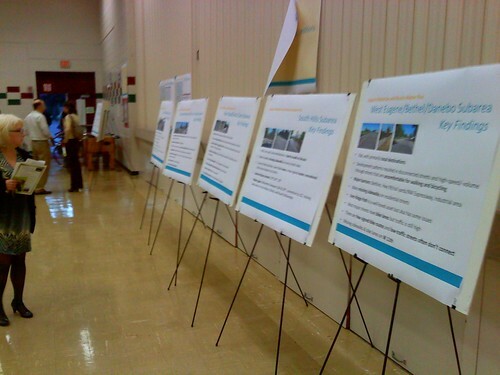 Below I’ve included the posters from the open house in PDF format so you can view them yourself. If you’d like to comment you have several options. You can edit the map provided here, or us this electronic comment form. Maybe I’ll see you at the Transportation Remix! George, thanks for the great summary. May I borrow your kerosine lantern for the next tweed ride? Looking forward to the Transportation Remix this Friday. Yeah – thanks for the great write up. I also wasted my time trying to post a comment on the Alan Pittman’s EW blog, only to have it never show up. Which makes me doubly thankful for the work you put into this site. @ Kevin. Me too. Had my carefully crafted comment on Pittman’s blog vanish into a black hole. Previous Previous post: Via SRTS: Pumpkin Kidical Mass Pictures! 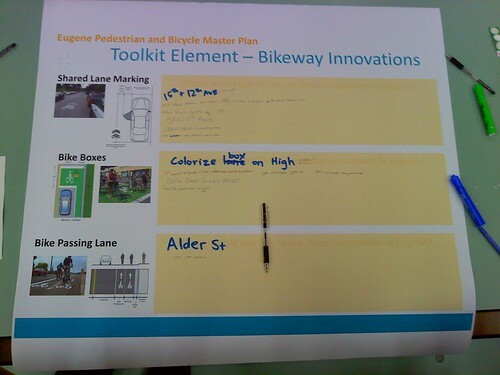 Next Next post: Ask WeBikeEugene: Who Yields at ‘Bike Path’ Crosswalks?